Set during the height of the First World War, Passchendaele tells the story of Sergeant Michael Dunne (Paul Gross), a soldier who is brutally wounded in France and returns to Calgary emotionally and physically scarred. The character is based on Gross’ Grandfather, Michael Joseph Dunne, who told Gross of his experiences in the war and whose death moved the actor-writer-director to create this project. While in the military hospital in Calgary, Dunne meets Sarah (Caroline Dhavernas), a mysterious and attractive nurse with whom he develops a passionate love. When Sarah`s younger asthmatic brother David (Joe Dinicol) signs up to fight in Europe, Michael feels compelled to return to Europe to protect him. Michael and David, like thousands of Canadians, are sent to fight in the third battle of Ypres, a battle against impossible odds, commonly known as Passchendaele. The film is a story of passion, courage and dedication, showing the heroism of those that fought in one of the greatest battles of the Great War, and of the ones that loved them. 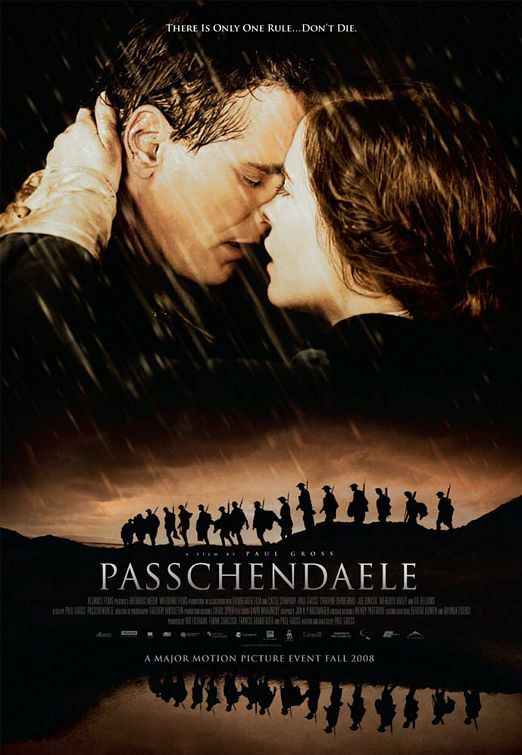 Passchendaele was selected to open the 2008 Toronto International Film Festival. Northernstars.ca chose Passchendaele as one of its Top 10 Canadian Films of the Decade in December 2009. Northernstars reviews the Passchendaele DVD.